Peel, core and slice the apples and place them in a medium sized sauce pan with ½ cup of filtered water. Gently cook for about 15-20 minutes or until they are just soft. Add the berries and stir through, turning the heat off. Mix together in a small bowl the coconut flour, bi-carb soda and coconut. Rub in the butter last until you have a breadcrumb consistency. 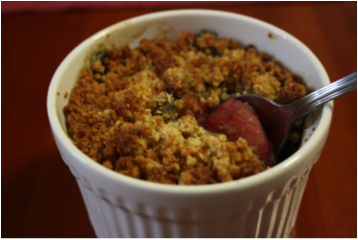 Spoon the apple and berries into a casserole dish and sprinkle the crumble over the top. You could use single ramekins if you would like. (5-6 serves). Place in the oven and cook for approx. 20 minutes or until the topping has turned a golden brown. They are best served straight out of the oven, so the crumble stays as just that, and doesn’t go soft. Take care as the filling will be hot.